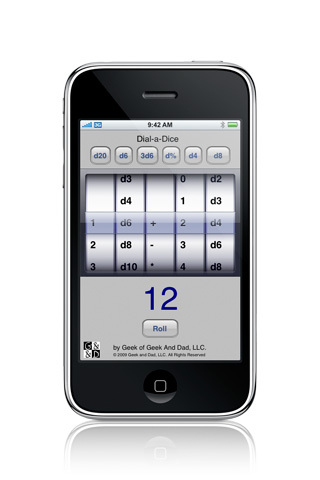 Dial-a-Dice is a unique dice rolling app which works with the iPhone™ and iPod touch®. Created by Geek, a 12 year old who loves Role Playing Games (RPG). Dial-A-Dice is handy for everything from character creation to combat. Also handy for when you need LOTS of dice for calculating the immense damage done by a dragon's fire breath. Its original interface allows complex die combinations, while remaining easy to use. 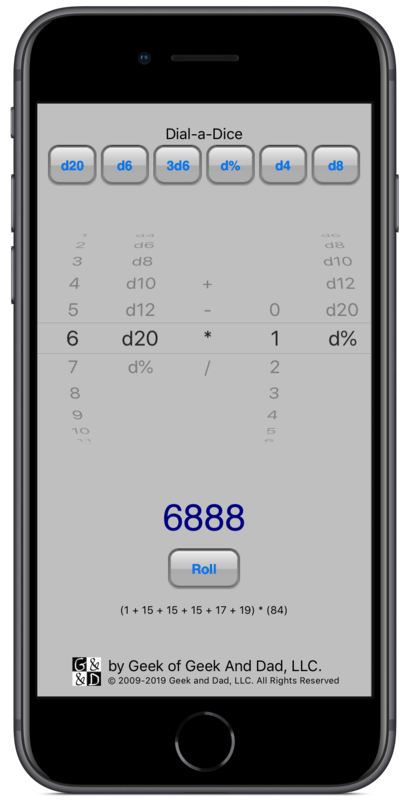 Use the included Quickroll buttons for commonly used dice, or you can spin the wheels to create custom combinations, including addition, subtraction, multiplication, and division. Just tap the "Roll" button and Dial-a-Dice will roll your custom dice for you. Rolls everything from d2 to d% (d100). For support please contact us!